This was an interesting exercise that I almost got right. 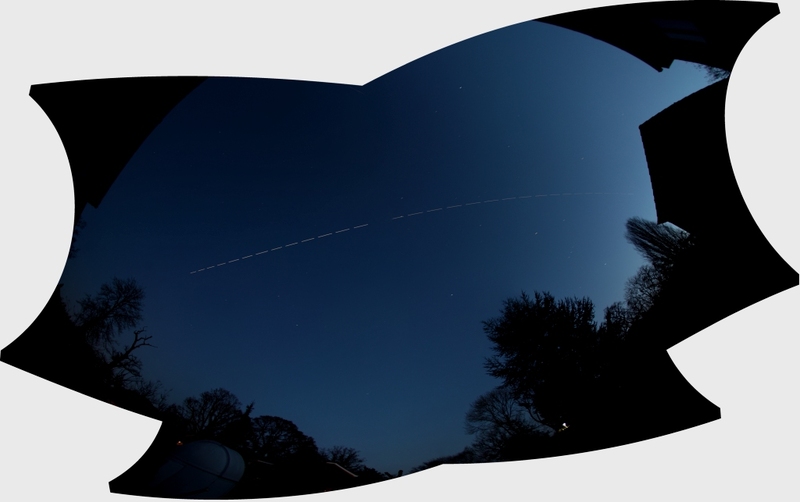 A long 6-minute pass of the ISS last night, so long that it went out of the field of view of the fisheye lens. So I rotated the camera as the ISS went over the meridian and carried on imaging. Didn't realise that I had managed to get that tree in on the far left so I made the mistake of rotating the camera a 3rd time - and unfortunately the 3rd dataset wouldn't merge with the first two sets. So I don't get the ISS moving behind the tree Never mind, I'll know what to do next time. The ISS trail is in 5-second bits as it was still pretty light at 19:15 and this was at ISO 100 (my minimum). Awesome effort either way Prof.